The Baby Trend Expedition is stylish, comfortable for both parent and baby, and super easy to use. On top of that, it’s one of the most affordable joggers out there. You can’t go wrong! The price of the Baby Trend Expedition is more affordable than most jogger of its caliber, making it affordable for most. You can fold the stroller down with ease and easily slide it into a trunk or the backseat of a car. And you can take that a step further if you take off the easily removable back tires. The front wheel swivel design makes maneuverability smooth and simple. Although the handlebar is made to adjust to different heights, if you’re taller than six feet, you might find it uncomfortable to navigate with the Baby Trend Expedition. The shoulder straps, which are part of the five-point harness system, are easily adjustable but have little to no padding for your child’s comfort. The Baby Trend Expedition is a little shorter than other joggers, making it easier to transport, but that also means that there is a little less leg room as your toddler grows. 7 THE BOTTOM LINE | An Awesome Buy! While being able to push a stroller with ease and be able to fold it up without wrestling with a slide and press system are important, safety is always a big concern when choosing a new stroller. With the Baby Trend Expedition, although it is not specifically designed for use with a newborn, adheres to the kinds of safety requirements most parents have come to expect in their strollers, jogging or not. The biggest safety feature is the five-point harness, which enables you to secure your baby in their seat as they grow, as opposed to dealing with straps that fall on their shoulders or dig in from being far too tight. There is also a tether strap that stays around your wrist, making it almost impossible to allow the stroller to get away from you. On top of the Baby Trend Expedition, there is an Adjustable canopy with a sunroof that has a removable flap, which can either let in sunlight or block it when it’s either too hot or bright outside for your little one. And since the canopy is adjustable as well, it can shield your baby on windier days. 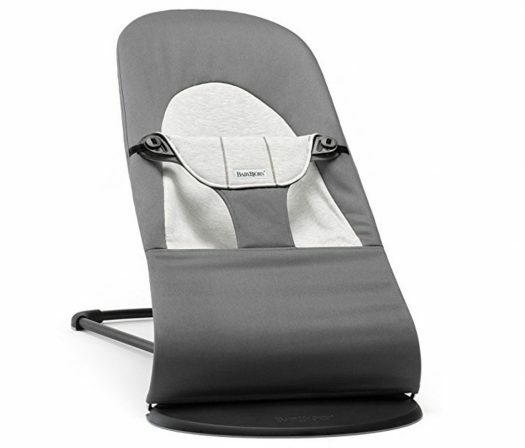 Although it is not recommended to place your newborn baby directly in the seat of the Baby Trend Expedition jogger, if you have any of the Baby Trend Flex-Lock or Inertia Infant car seats, they have the ability to lock into place in the stroller, making the jogger one to be able to fit your newborn in safely as well. …able to fit your newborn in safely as well. With the Baby Trend Expedition you’re going to find little areas of comfort that both you and your baby can enjoy. Since the tires of the jogger are large, they tend to roll easily over gravel and rougher terrain, allowing for a more comfortable and less bumpy riding experience for your baby as they sit or lay strapped in. And should they prefer to lean back or nap while in the Baby Trend Expedition, the padded seat reclines to multiple positions. And, when necessary, the seat goes into a full incline, making stops for naps a little necessary. … the padded seat reclines to multiple positions…. For the adult pushing or jogging with the Baby Trend Expedition, there is an extra wide rubber handle that spans across the top of the stroller instead of being designed with two handles, which makes it much more ergonomically shaped. It’s also covered in a thick, soft rubber, so there will be no foam pieces gradually shedding off the handle. And since the handle is comfortable for you, it makes it easier to glide along paths that are more uneven or not paved altogether, making it a more comfortable ride overall for baby. The height of the handlebar of the Baby Trend Expedition jogger also makes it possible for parents of different heights to jog comfortably with it, without feeling like they’re slouching down or holding their arms at an awkward position as they hold on. The seat of the Baby Trend Expedition itself is made of a breathable fabric that makes it easy to wipe off, while still providing enough comfort for longer stroller excursions. The adjustable handlebar with extra gripping rubber on the Baby Trend Expedition makes it easier for parents of any size to keep up with the jogger and the ability to recline the seat into multiple positions means extra comfort for your child too. This model comes in at 47x21x41 inches and weighs 25.5 lbs, which is fairly standard for a stroller of this kind. 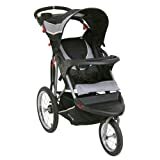 Being a jogging stroller specifically, the Baby Trend Expedition is literally made to handle tough terrain and longer outings and because of the larger tires and big, single front tire, there will be no random tire jams while trying to maneuver the tire back into place. The front wheel has a lock you can engage to lock the swivel feature when you’re out for a straight jog. But you can disengage it when you want the wheel to have more motion once again. Once folded up, the two rear tires also come off with a “click release,” making it easier to store or for travel. However, it isn’t necessarily to remove the tires each time. When you are ready to fold up the Baby Trend Expedition, there is a simple “trigger fold” latch to pull on one side of the stroller and it will collapse. Along the top of the stroller, right under the handlebar, are two cup holders and a small covered compartment that’s just big enough for a cell phone and keys. The cup holders are big enough to hold adult-sized water bottles that won’t shake around when moving, but also won’t be hard to take back out. Underneath the Baby Trend Expedition, there is an extra wide storage basket that is made of a canvas material, as opposed to mesh, meaning less chance of holes ripping through it, as it can hold a substantial amount of accessories. The toddler tray on the Baby Trend Expedition jogger also has two cup holders for your child’s comfort and also so you don’t have to share yours. But when it’s time to take your toddler out for a break or when your jog is over, the tray is a “swing away” tray that doesn’t have to come completely off in order to get your child out of the stroller. The trigger fold latch on the Baby Trend Expedition makes it easier to fold the stroller down with one hand, but the ability to remove the rear tires with a similarly simple click makes it even easier to transport and store the jogger. The cost of this stroller is super affordable, coming in at about (MSRP) $109.99, making it one of the most affordable jogging strollers out there. And when compared to some of the more expensive models, it definitely holds up. Buy right now on Amazon, and you can have this awesome jogging stroller in no time! (Check it Out). Depending on how often you use the Baby Trend Expedition for jogging or more low impact walks, it can indeed last years until the tires need to be replaced or until your child actually grows out of it. It’s important to keep in mind the safety guidelines of the Baby Trend Expedition, which allow you to use an infant car seat that clicks into place, as well as the fact that when they can finally sit in the actual car seat, they’ll be able to recline completely, making it a comfortable and safe experience for young babies and older toddlers. Because of the ability to click a Baby Trend Flex-Lock or Inertia Infant car seat into place on the actual tray, the Baby Trend Expedition jogger isn’t a stroller that you have to wait to use. While some may require that you only utilize them when your child is old enough to sit in the seat provided, the Baby Trend Expedition makes it possible to use it from the time your baby is six pounds up until they’re either 50 pounds or 42 inches tall. This means that you can get legitimate use out of the Baby Trend Expedition for several years before it’s time to move on to something else better suited to your toddler who may not be a toddler anymore at that point. …one of the most affordable jogging strollers out there. THE BOTTOM LINE | An Awesome Buy! The cost of the Baby Trend Expedition is hard to argue with, but since the jogger also has a certain level of quality that you expect, it makes it that much more of a value. Baby Trend is a typically affordable brand for most parents, so it only makes sense that the value and quality would be placed in their joggers too.